I am a mother to five, yes five, amazing kids. They are far from perfect, but I was far from a perfect parent, we managed. Being in the arts and entertainment industry there is sometimes a fine line between what is private and what I talk about. Most of the time though I know I am not alone. I know there are other moms, parents, loved ones who are experiencing some of the things I go through and talking about it helps. It helps me get through it, it helps others trying to get to the point I am at and more. This is absolutely one of those situations as for weeks it put a standstill to our life and now things are turning into a new normal for us. So back to Mother's Day. I must have sent about 20 messages to my daughter and her friend.. Neither were answering.. about 15 minutes in I figured they knew they were in trouble and are not going to answer. I called her best friend's mom and she immediately came over. We looked everywhere and saw so signs of them. I called my oldest daughter and asked her to try to reach her sister. She ALWAYS answers for her sister... she didn't answer and the lump in my throat told me something was very wrong. My oldest immediately drove to our house. Within the hour we had contacted police and was waiting for an officer to show up which felt like the longest time. After waiting over an hour an officer with JSO showed up and started getting information from us. Within a few minutes he stated that he had just left the scene of an accident. He said he had to be honest and let us know it was a very serious accident and there were two girls matching our girls descriptions.. Inside I lost it.. as I type this now the tears just fall. There is NOTHING scarier than a police officer telling you your child MAY be in the hospital and that he has no clue of her condition IF it is her. So he began asking a whole bunch of questions and my mind was not trying to hear any of them. All I knew if my child might be injured. He asked us to send some pictures. We sent many. He kept asking questions. My gut said GO! So that's what I did. I told my husband and the kids we did not have time to wait around on these questions and let the cop know he was more than welcome to follow us to the hospital but we were leaving. Thankfully my husband is pretty good at staying cool under pressure and we arrived safely to the hospital. We ran in and started asking questions. Then the real wait started. We arrived at the hospital around 9:30pm. I did not see my daughter until 3:30am. Literally the longest wait of my life. Longer than all five of my children's births.. it was awful. After begging them to give us answers so many times they allowed two of us to the back at some point in the night. My husband waited with our 15 year old and I went with my oldest to the back. They had let us know NOTHING at this point, put us in a small room and had us wait. Do you know the fear that settles into your heart when placed in a small room like this?! I had no clue what they were about to come out and tell me and I was scared. I tried like hell to stay as calm as possible but it was not easy. After a couple hours of waiting I reached out to John Phillips, a local attorney here in Jax that is amazing, and he was driving in the rain but had a colleague call me immediately to assist in any way they could. I ended up not needing any more help but I mention them because in my time of need they were there without hesitation and it meant the world. At this point all we knew was there had been a car accident. My daughter and her best friend were in the backseat. The car hit a concrete barrier and they were in trauma. Trauma. The news was reporting a possible fatality and everyone else in critical condition. We were in a small room with a whole lot of questions and fears but no real answers. They kept asking us to send additional photos of her, all we could think was how bad was it if they could not recognize her?! The hours were painful. Finally doctors started trickling in.. the first one looked me in my eyes. He told me it was ok, my baby was going to be ok. She was injured but I could calm down, he could see it in my eyes. He could see the fear. Then information finally started to trickle in about her condition. Neuro stated she'd broken her neck. It was in the C2 and she would be getting a halo device (brace that comes down over the chest with pads and then bars around the head. It is stabilized by placing 4 anchors into the skull) immediately with the possibility of neck surgery in the next few days. Ortho told us she had broken her leg and fractured her hip. The leg would require surgery. They would need to place a rod in her femur bone. The rod would be permanent. Other docs informed us of some cuts and a few minor things. We FINALLY got to see her at 3:30am. She was in SICU (Surgical Intensive Care Unit). She had on her halo, her leg was attached to these metal bars and a weight, she had a tube in her throat to help her breathe and there were wires everywhere. It was such a rush of emotion. 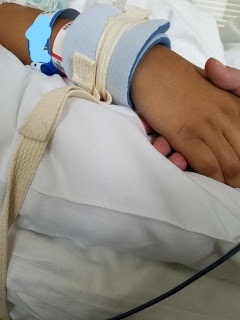 I was so happy to lay my eyes on her, to hold her hand (which was strapped down to prevent her from removing the tubes), but I was also scared. Scared of what she had been through, of how hurt she was and how hard it would all be on her. So many emotions just running full speed through me. Most of all though I was just grateful to have my baby. Her bestie was across the hall. She was fighting too but in her own way. They both were very injured and had to fight very hard the last almost 2 months. Thankfully, my daughter did not need immediate neck surgery. The surgeon believed the halo would help correct the injuries but she would be in it at least three months. Today she is walking, returned to being a semi typical teenager and counting down the days until she gets to have the halo removed. I was off of work to be at her side for a month and now I am back for limited hours, we lost a car during that time and a number of other things happened. My daughter's godmother started a GoFundMe which we were so grateful for as it did help and still gets the occasional donation. Of course much more happened over the next few weeks and I will try to touch bases on all that over my next few blogs. I always say I need to stay on top of these things and then you know life happens. I'm here though and one grateful mama.